During the French and Indian war when Palatine Village (Herkimer) was destroyed, Andrustown went unscathed because it was off the beaten path. However, during the Revolutionary War, Andrustown was wiped from the face of the earth in what is known as the Andrustown Massacre. Andrustown was located in the highlands eight miles south of the Mohawk River at the headwaters of what is now Fulmer Creek. In 1739 a Surgeon in the British Army purchased 20,000 acres of land in the hills several miles south of Little Falls. His name was Henderson and a farming community that eventually developed in that area was called Hendersontown. Most of the families that settled there were Palatines, so the English name was gradually corrupted in German to: Andrea’s Town, Andreastown Andriestown or Andrustown. This historic monument is located at a sweeping bend in Route 167 just .7 miles north of Holy Trinity Monastery. By 1759 when Palatine Village was destroyed by the French and their Indian allies, Andrustown was a successful farming community. Because it was high in the hills, eight miles south of the river, it was spared the wrath of the French and Indian army. This historic site and marker are located at the corner of Hicks Road and Williams Road North in the Town of Warren, Herkimer County . By 1776 Andrustown was tied religiously, culturally and economically to German Flatts. The minister from Fort Herkimer Church traveled the winding road into the hills to bring the word of God to such families as Grimm (Crim), Stauring (Staring) Osterhout, Frank, Moyer (Hoyer, Hawyer), Bell, and Lepper. These farm families lived in comfortable frame houses and stored grain in spacious barns and sheds. Andrustown men served in the militia that stopped the British and Iroquois at Oriskany in August 1777. Their fields produced wheat, hay, and livestock, some of which was destined for the Continental Army. “In July, 1778, Stauring, Leppard, Hawyer and the two Bells, father and son, went to Andreastown to secure some hay, prepared to stay several days. At this time Fred Bell, Sen., was an old man and a widower, but the wife of the younger Bell, with the wives of Stauring and Hawyer joined the party to cook for them,, and render such aid as they could. With the workers were two boys, one a son of Stauring, then in his teens, and Richard, a son of Fred. Bell Jun., some eight years of age. Just after breakfast on the morning of the 18th, when the men were engaged in their pursuit, a party of Indians with several tories, one of whom, some say Capt. Caldwell, led them, appeared suddenly in the settlement. The Bells, father and son, chanced to be near their dwelling, and as the Indians approached it, the latter who had often said he would not be taken alive, ran into the house and was shot through a window while in the act of taking down his gun from a pair of brackets. His father, who was arrested near the door, was ordered to catch a grey horse, owned by the Bells, which was in a field near and told that his life should be spared if he got it ; but as he was climbing a fence into the field, he was shot down and there scalped—the enemy, no doubt, fearing to trust him any distance from them. “The firing at Bell’s seasonably alarmed the three men at work some distance off, and they fled and escaped to Fort Herkimer. The enemy arrived at Stauring’s dwelling too soon after the firing for any of the inmates to escape, but young Stauring in attempting to do so, was shot down at a little distance from the house and killed, while the Bell boy was made a prisoner. The women were preparing to make bread when the surprise came, and young Stauring had been providing oven-wood. No indignity was offered the women, if we except their being divested of several articles of clothing, ere they fled from this terrible scene. This war party as was subsequently learned, was sent thither by Brant , who was then in the vicinity of the Little lakes only a few miles distance, with a large force; being instructed by him before it left camp, not to kill or capture any women at that place ; and having secured what plunder they could, such as eatables, clothing, guns and three reeking scalps, the destructives reduced all the dwellings in the settlement to ashes, and with their little prisoner—who was compelled to witness the conflagaration of his birth place, in which was the body of his father, they soon retired. From an unnamed newspaper article: “W. J. Winstein of Academy street furnished the following interesting story of the early settlers in the Chartiers Valley. The paper was presented to Mr. Winstein by descendants of Robert Bell, Sr., and for a number of years was stored away in an old trunk, where it was recently found. The Bells were the first settlers in the Chartiers Valley, staking out a claim in what is now known as Rosslyn, in 1768. Many descendants of the original settlers are still living in this vicinity. The paper follows: “Robert Bell, Sr., of Tyrone, Ireland, and wife, of Edinburgh, Scotland, located four miles from Romney, Va., on the south branch of the Potomic river, in the seventeenth century. Mr. Bell had many narrow escapes from the Indians of that forest. In company with two other young men, named Vaughan and Scisson, one day Robert Bell was in search of strayed horses, when the party was surprised by an Indian ambushcade on a branch of __augherty Run, Va. Vaughan was killed, a savage threw his tomahawk at Bell and wounded him. Scisson turned on his horse and fled. After the fight Mr. Bell was able to get on his horse, but he only went a short distance when he fell off. Mr. Bell’s horse arrived home before Scisson did and a party at once was formed to search for Bell. The party met Scisson at the Ohio river and he related what had happened to Mr. Bell. They supposed he was dead and returned to their homes. Within a week later they found Bell at Ft. Pitt, his wounds dressed by Dr. Knight, who figured conspicuously at the burning of Crawford. Mr. Bell served in the expedition of 1754, during the French and Indian War, and was among the number who accompanied General George Washington on his first trip on the Ka_awha. General Washington made a note in one of his diaries of those who accompanied him in his canoe. “Mr. and Mrs. Bell had eight sons and two daughters. James Bell, Sr., the oldest, was born in 1751. When he was a small lad of ten years, his father went to Patterson Fort for a wagon load of wood. James and his brother went along, their father wanted them to gather wood while he was hauling some home. The two boys were busy gathering wood when the Indians attacked them. They caught James but his brother ran and the Indians shot at him and he fell under a log, the Indians thinking he was dead; he was not hurt, however, and later went home and told that James was captured. The Indians took James to Indiana and kept him there till he was returned by treaty. When his father went after him he took two horses that James might ride home. When they met, James got on the horse but had ridden only a short distance when he saw a woman and some children who were also set free. James dismounted, letting the woman ride. “When he arrived home it was at night. His mother, hearing the wooden latch lift with a string, called: ‘Is that you, James?’ and his father answered, yes. It was a joyful meeting. James had many stories to relate of his capture. Among them, was that when the Indians took him the Ohio river they made a canoe and put him in it and they had nothing to eat save what they called ‘cush meat.’ He always claimed they crossed into Pennsylvania and came through Chartiers Valley, near Chartier’s Creek. He told how they would have two lines of Indians and would make him run between the lines. And of an old Indian squaw who would be angry if they struck him, but he was a fast runner and did not get struck often. They pulled all his hair out of the top of his head and put rings in his ears. After he had been with them awhile the Indians got very friendly with him and when he left the old Indian squaw cried. During the American Revolution, Andrustown was a settlement of German families about 2 miles north of the present village of Jordonville, Herkimer County, NY. After the battle of Oriskany, the families sought refuge in Fort Herkimer about 8 miles to the north. They did venture out from time to time to plant and tend their crops. On one of these trips on July 18, 1778, they were surprised by a raiding party of Indians and Tories. Richard Bell, a boy about 8 years old was take captive. Both his father and grandfather Frederick Bell Junior and Senior were killed. His mother Dorothy and younger brother Adam escaped by hiding in the forest and made it back to the fort. Richard was taken to Canada and adopted by an Indian family. It was ten years before he was reunited with his mother. Because of a scar on his chest from a wound recieved in infancy, his mother was able to make a positive identification. Richard lived with his mother, but the traits of the Indians never left him. He would gladly exchange his white man’s clothes fo the Indian costume and take himself to the woods to hunt and fish. He could not adapt himself to the civilized life, and became melancholy, soon sickened and died. 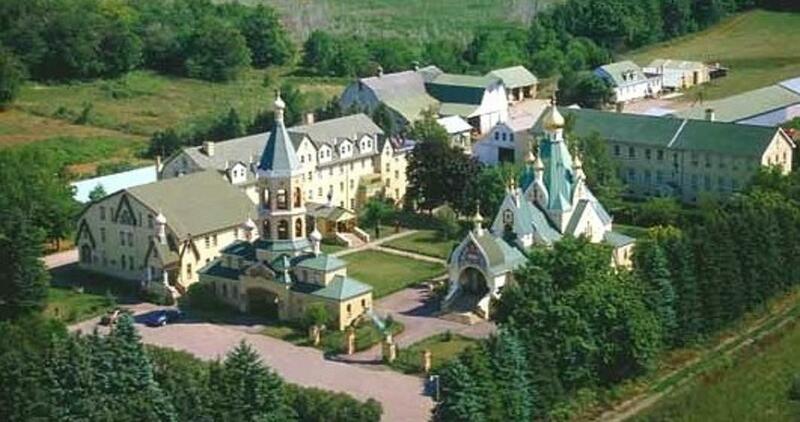 Holy Trinity Monastery is located off Route 167 between Jordanville and the site of Andrustown.